I keep on saying it, and it keeps on being true: You can find heraldry everywhere! I this specific instance, my wife and I were taking a day to ourselves and just spending some time with each other away from the house and all the work that needs doing there. As part of that day, we went over to a large antique mall that we visit occasionally, because (1) it's the kind of thing we like to do, and (2) there's so much cool stuff to see. The downside of doing this, though, is that we sometimes spend money there and bring some of that cool stuff home, where we have to find a place for it. And, wouldn't you know it, some of the cool stuff we saw, and bought, and brought home, had heraldry on it. I have a modest collection of Wedgwood armorial plates, ashtrays, and pin trays. Most of them are what Wedgwood calls Jasperware, which has a rough-feeling textured finish to it. One of the themed collections I have that I'm particularly proud of is what I think of as the "London" collection. 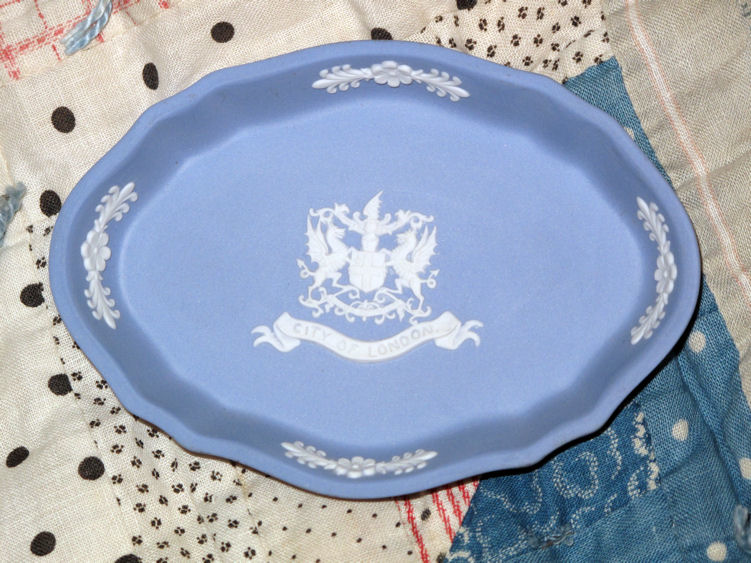 I have four plates with the achievement of arms of London on them: one plate in "Wedgwood blue," one terra cotta (with the arms done in black), one black, and one olive green. I also have a blue one with the arms of London and a scroll commemorating the term of "Sir Edward Howard, BT" as "Lord Mayor 1971-2". And to round the set out, a Lloyds of London plate done in Lloyds of London green with the firm's arms on it. Now, to add to that collection, I found - and purchased - a pin or sweets tray with the achievement of arms of London on it. A nice addition to the collection, don't you think? 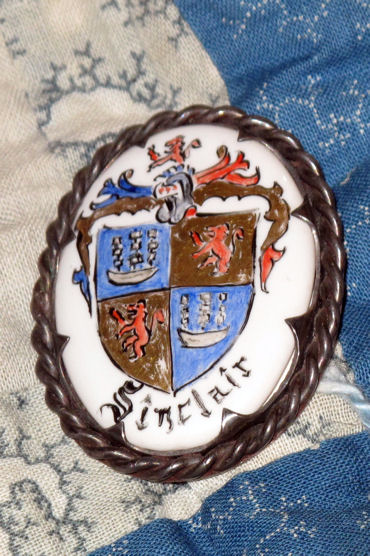 Then Jo Ann found an armorial brooch that caught her eye, with the arms of Sinclair (well, sort of. They lack the black engrailed cross overall that normally appears there. And comparing the arms on the brooch to the Sinclair arms in the Sinclair Earls of Caithness in the Dublin Armorial and Lord Crawford's Armorial, the second and third quarters, which on the brooch are painted in gold, should be white. Still and all, though, it was a nice couple of heraldic finds to be found on a pleasant fall Saturday, and I'm glad that we ran across them.